Above is a list of how some Google-users recently wound up visiting Nosy Girl. Welcome, fellow fans of Josh Charles' nose! 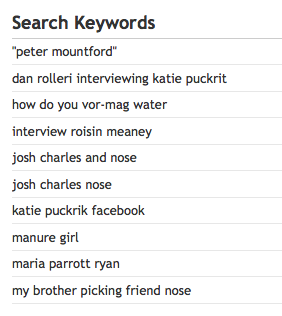 It is I, your captain, Manure Girl, unsure how to vor-mag water, but very curious myself about that last string of search terms. Was the searcher concerned about her brother picking his friend's nose, or was she hoping to find video footage of such an activity? This is awesome, Manure Girl.